I’ve been asked this question many times. The answer is simple, and maybe a little bit disappointing. There is no such thing as the best project management tool. There are heaps of good tools available (Jira, Basecamp, Trello, Project Place,…) but you can’t put all your hopes into one tool for resolving problems within your team or organisation. When you think the solution lies in a new project management tool, think again. This will probably not bring solace. You get the best results when you don’t force a specific tool in your organisation. If you want to monitor general goals, that are important for everyone in the company, you can use a single tool and ask everyone to use it for reporting those general goals. But on a team level, let teams decide which tools to use. If they prefer to use paper post-ITs and a wall with a kanban board, let them do so. Give teams the power and the responsibility to choose their own tools. As long as reporting and monitoring that has an importance for the whole organisation is managed in the overall tool. A fascinating example of non conventional tools was pointed out to me by Jürgen. 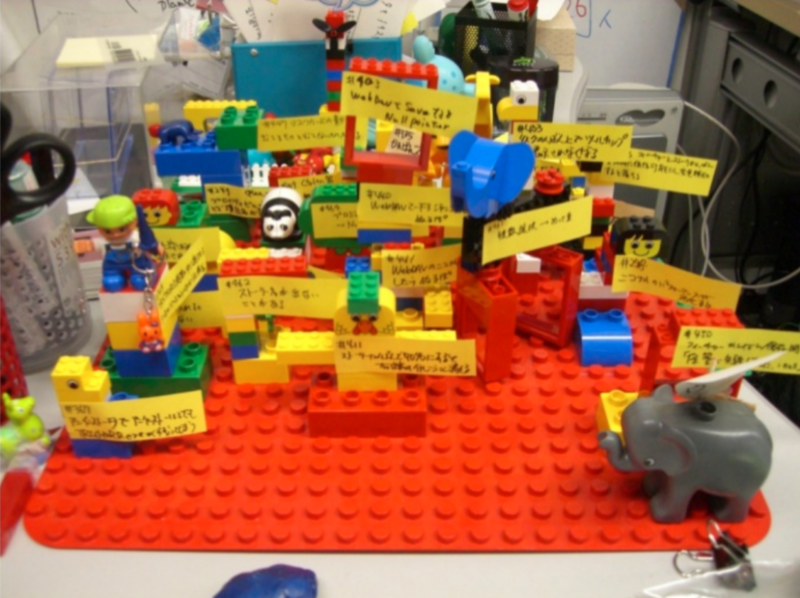 It consists of using Lego bricks for bug tracking. The general idea is that bug trackers aren’t really transparent. They don’t make bugs really visible. Instead, a physical lego board is used to visualize bugs. Every bug gets his own tiny Lego structure. The larger the structure, the bigger the bug. The more upfront, the higher its priority. Secondly, a classic bug tool has no constraints. So bugs tend to build up in endless lists. The Lego board has physical constraints. So when it’s full, bugs have to be removed, to place new bugs on the board. Plus, it makes resolving bugs a lot more fun. To read more about it, check out this slidedeck from Takeshi Kakeda on Tangible bug tracking with Lego bricks. This is a rather extreme example, but it illustrates perfectly that tools are worth thinking about before forcing them in your organization. To be clear. This is not a plea against tools in any way. I’m a big fan of using good tools in a good way. But it shouldn’t become a dogma. If there are things that improve interactions between people, it doesn’t matter which tool it is. As long as the focus is on interaction and efficiency. I would like to suggest proofhub project management tool for proper organization over projects. It has got bug/issue lists, calendar, notes, files besides other useful features. I’m all in favor of individuals and interaction over proces and tools. And for that my answer to the best project management tool, has been the last years: your ears. Listening to people is a tool you can learn to foster the individuals and their interaction. That said, I love the lego reporting tool. lego blocks so they limit the “bugs in progres”. I know of teams that used that to enhance quality.